the file to a Microsoft cloud service. That service uses heuristics and machine learning to figure out of the program is malicious. If it cannot make that determination, a copy of the program is sent to Microsoft and if they think it might be malicious, it will tell Defender to block it. This process typically takes just 1 to 4 seconds and only occurs the first time a user runs a new program so they are unlikely to notice the delay. 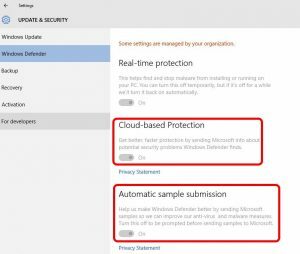 This is a great way to keep your company safe and if you are using System Center Endpoint Protection (= corporate version of Defender) you can easily enable this feature. NOTE: this article implies that SCCM is not supported but I have confirmed that it is . If you are a Microsoft Partner you can read my thread HERE.